The ACMA is so pleased to have some of our founding member musicians return to our stage! 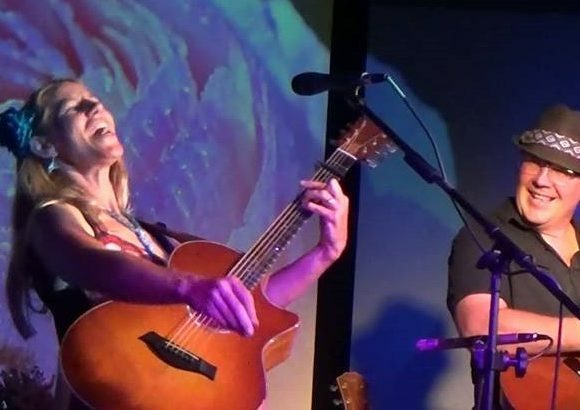 Master guitarist Bruce Hecksel and singer-songwriter Julie Patchouli blend music from their two musical projects Patchouli and Terra Guitarra. Terra Guitarra is reviewed as “one of the top nuevo-flamenco groups in the world” – Zone Music Reporter. They have three top 5 internationally charting albums including Of Sea & Stars just won ZMR Award “Best Instrumental Album of the Year 2017”. In 2018 Patchouli & Terra Guitarra went global bringing their music all over the world touring the UK and Europe, China and the U.S. In 2019 their album Spirit Wheel was nominated ZMR “Best World Album”. The duo contines to tour across the U.S. and returns for a 2nd bigger tour in China in July of 2019. Founding member musician Andy Getch will open for Patchouli. Andy has been an important part of the ACMA since its inception…and he continues to volunteer for us, write new songs, paint cool stuff, host house concerts and perform on our stage!